Acupuncture has more than it’s share of detractors, mostly folks steeped in western science and medicine. For many people any evidence of acupuncture’s efficacy is purely anecdotal. We are children of Science and Reason. We want to know HOW IT WORKS. Explanations of meridians, Yin and Yang, and Qi (Chi) don’t cut it for the skeptics. Now, though, the skeptics are starting to take notice, thanks to high-tech imaging devices that illustrate exactly how acupuncture affects the brain. Past acupuncture studies have been relegated to trial and error. Some study groups were needled, some weren’t. Some seemed to respond, some didn’t. Many impressive studies have been done on animals. Because animals do not experience a “placebo effect,” the results could be considered untainted and positive to acupuncture. After all, acupuncture is now being used successfully on thousand dollar show dogs and million dollar racehorses. It is agreed that acupuncture causes the body to release “feel good” endorphins into the blood stream, lessening pain and providing a sense of well-being. But how can endorphins in the blood stream translate into healing? Skeptics insist that these experiments didn’t determine cause and effect and were not properly controlled. Depending on a scientist’s predisposition, either an experiment proved acupuncture a failure or a flop. The turning point for Cho was a walk up a Korean mountain in the wrong shoes. He slipped, injuring his back so severely that he could barely walk after his flight back home to California. Although he scorned acupuncture, no western medical treatments seemed to help. He finally gave in to urging from his relatives and went to see an acupuncturist. After a 15-minute procedure, he had to admit it: acupuncture works. Acupuncture melted the pain and spurred Cho to use modern technology -- a functional MRI machine (fMRI) -- to explore old medicine. The results, published in 1998 in the Proceedings of the National Academy of Sciences (one of the world's premier scientific journals), showed a direct correlation between acupuncture and the brain, the first time any effect in the brain has ever been demonstrated. Cho first hooked subjects up to the fMRI to examine the effect on their brains when bright lights were flashed in their eyes. As expected, the visual cortex of the brain showed increased blood flow. Then he tried two different tests with needles. He had a skilled acupuncturist needle the acupoint in the little toe, used by acupuncturists to treat eye diseases, measuring the results with the fMRI. He also had the acupuncturist needle a spot nearby that acupoint that is not considered to be related to the eyes. The results were strong: when acupuncture was used on the non-visual acupoint, the fMRI showed no change in the brain’s visual cortex. However, stimulation of the vision-related acupoint showed the same reaction in the brain as direct stimulation of the eye with light. Cho noticed something else. When he did a series of fMRIs, alternately flashing and shutting off the light, and graphed the results, two distinct patterns emerged. Four participants showed an increasing flow of blood to the cortex; eight showed a decreasing flow. He repeated the experiments several times, with the same results. It was as if the two groups were opposites of each other. And indeed, they were. When asked why this might be, the acupuncturist assisting Cho gave the reason as Yin and Yang, so elemental to Oriental medicine, yet still a mystery to Western medicine. Without seeing the data, the acupuncturist was able to correctly identify which subjects showed a Yin response and which showed Yang in 11 out of 12 cases. The two types tend to correlate to the Western type A and B personalities, he said. Yang, or Type A, tends to have a hasty or positive attitude, a high heart rate and warm body. Yin, or type B, tends to have a lower heart rate, cold extremities and cautious and often negative attitudes. Still Cho didn't understand how it all worked: what was the connection between the tip of the little toe and the visual cortex? He asked a UC Irvine Neuroscientist, who seemed unfazed by the question. He explained that the nerves in the foot connect to the central nervous system, which connects to a part of the brain that includes the visual cortex. As the acupuncture signal passes to the brain via nerves, it possibly stimulates the hypothalamus, the "executive center" of the brain, responsible for the production and release of hundreds of neurochemicals. These neurochemicals, together with the autonomic nervous system, may have some effect on vision-related disorders. 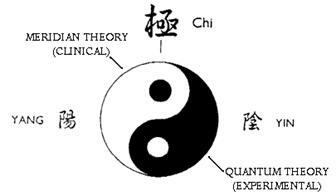 Perhaps, Cho suggests, the neurochemicals are the energy known to acupuncturists as Qi. With around 1,500 acupoints on the body, Cho has a long way to go with his research. But he's hooked now. He's applied to the National Institutes of Health's Office of Alternative Medicine for a $12 million grant to continue his research. Not only could it lead to more understanding of how acupuncture works, and thus greater acceptance of it by the Western medical establishment, but acupuncture may also enable scientists to use MRI technology to explore areas of the brain they weren't previously able to reach. For example, scientists could use acupuncture to stimulate digestive acupoints and watch the effect in the brain; it would be more difficult to do that any other way. Others are working with modern medical advances to unlock the mysteries of acupuncture. Based on 15 years of research, The Biophysics Basis for Acupuncture and Health, published in 2004 by Dr. Shui Yin Lo, attempts to bridge Chinese medicine and western science using molecular biology, quantum physics, and quantum field theory as well as other sciences. Dr. Lo is a professor of Chinese Medicine and former Physics professor at the esteemed California Institute of Technology (the west coast’s MIT). Using infrared imaging, he was able to detect noticeable differences in temperature in the body after acupuncture treatment. He has theorized that acupuncture meridians are made up of polarized particles (perhaps water clusters), which align to form an electric field throughout the body’s network of meridians. When the alignment of these particles is disturbed, sickness and pain result. Acupuncture works to help re-align these charged particles, allowing the Qi to flow and the body to heal itself. Discovering how acupuncture works is perhaps years away, but now scientists have proof that acupuncture affects the brain and body beyond any placebo. It activates specific portions of the brain associated with the problem being worked on, and it affects the body’s temperature at sites of healing, as shown through infrared imaging. Acupuncture is truly an art for all ages, and as newer studies are performed we will see acupuncture treated not only as an art, but a true healing science. Anyone who has been to the clinic recently knows we’re undergoing some changes – the acoustic ceiling is being taken off, décor is being changed, walls are being painted. All paint is no VOC (volatile organic compounds), so fumes should not trouble those with chemical sensitivities. These changes will take place over several months, so the clinic may have an “unfinished” atmosphere for a while. Please bear with us throughout our changes. We hope you will like the improvements to the clinic! Dr. Tai-Nan Wang L.Ac., O.M.D., Q.M.E. © Copyright 1998 - 2007, www.lifestrong.com.